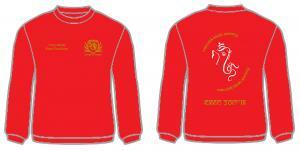 Red pullover sweatshirt embroidered with Hindu Society logo on front left chest. Logo and surrounding 'Warwick Hindu Society' text printed on back. Personalisation of a name and/or exec position embroidered on front right chest. Exec sweatshirts also printed with 'Exec 2017-18' text on back as per image above.